My Rhubarb and Ginger Pie brings together the age old combination of sweet and sour as the soft rhubarb and ginger filling is encased in a sticky syrup and sweet pastry crust. And what’s more…it’s in season! I hadn’t really discovered rhubarb until a year or two ago. We have always grown it in our garden but it was something the parents sneakily ate when we had gone to bed. Because of this I never really had much interest in it as a fruit. The other fruit we grew like apples and gooseberries were eaten almost daily in our house during the summer months but the rhubarb was kept hidden away! The more I got into cookery shows the more I became intrigued by this bright pink fruit! (How you get it to retain this bright colour while cooking still escapes me: answers on a postcard please.) If it was good enough for celebrity chefs it was good enough for me surely? I really fell in love with rhubarb in a delicious rhubarb crumble. The topping had a claggy yet crunchy texture and the filling was so soft and sweet yet sharp at the same time. The combination of textures and flavours was to die for and I knew I had to try and recreate my own. Crumbles feature a lot in my cooking. You can find an Oaty Apple Crumble and Gooseberry Crumble already on the blog, and in a week or two’s time I will be posting a Spiced Pineapple Crumble (seriously amazing, watch this space!!!) 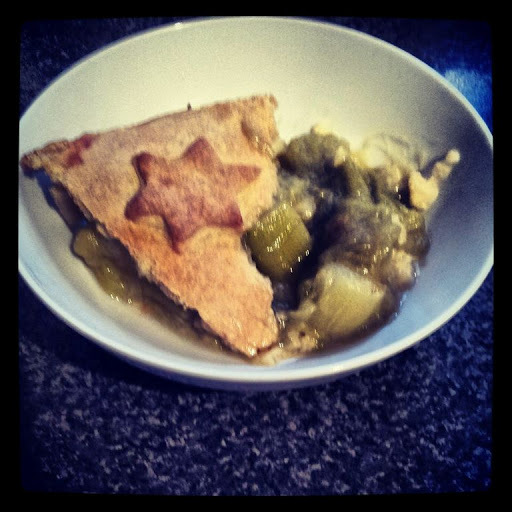 So with that in mind, plus the fear I could never recreate the amazing rhubarb crumble that made me fall in love with the fruit in the first place, I decided instead to try a pie. This Rhubarb Pie is made with a sweet crust – a basic short crust pastry spiked with sugar to give the pie a lift and balance out the sour notes from the rhubarb. The filling however isn’t just sour and soft, the ginger adds a warming note to the mix and by pouring over a sticky, sweet syrup the filling has a luxurious silky quality to it. It’s also incredibly easy to make. Of course, should you choose, you can make it even easier by buying your own short crust pastry, but making it yourself gives a homely, rustic quality to the dish which I believe every pie should have! 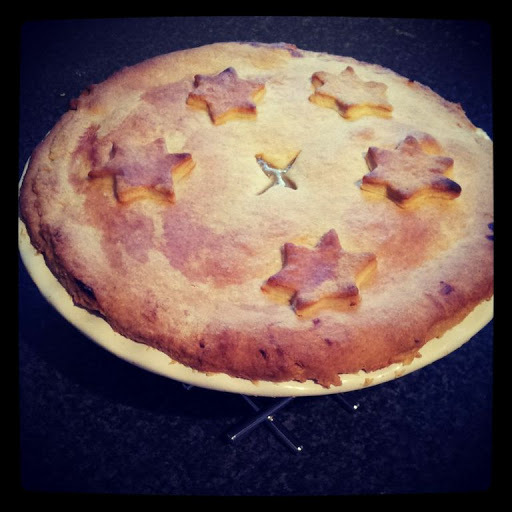 Pies should be made with love – my first attempt at this dish was actually decorated with freehand hearts. 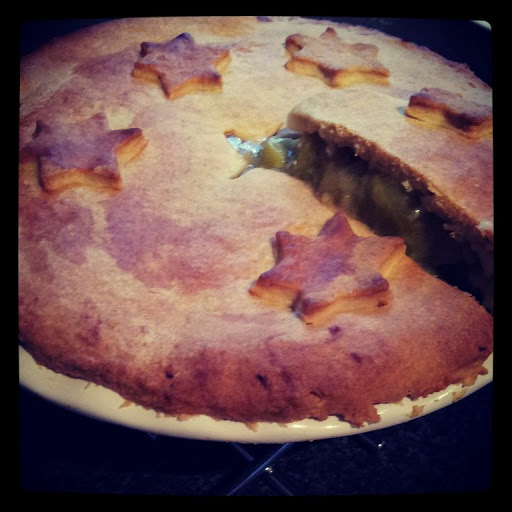 The second time round I topped it with stars! Use the scraps of pastry leftover to add your own embellishments to the pastry lid for a pie that will not only taste amazing, but look amazing! If you make this pie at home pop a link or a pic of it in the comments below. I’d love to see how you choose to decorate your pie. Rub together the fat and the flour (either by hand or using a food processor on the pulse setting) until the mixture resembles fine breadcrumbs. Add the caster sugar and mix to ensure it is distributed evenly. Next add the water a tbsp at a time. Using a spatula or butter knife mix in the water. When the flour has begun to clump together use your hands to bring the mix into a ball. Place in a bowl covered with cling film and pop into the fridge to rest for half an hour. While the pastry is resting take off the outer layer of skin from the rhubarb and chop into pieces roughly 1 inch long. Places these in a large heavy pan with 4 tbsp of water and the ginger grated finely. Let the rhubarb stew for 5 mins before giving it a stir. Stew the fruit for another 5 mins or until it has started to become tender. Drain the rhubarb retaining the liquid for the syrupy sauce. Allow the rhubarb to cool whilst adding the remaining sugar to the pan with the rhubarb juices. Avoid stirring the mix and let the sugar dissolve. Gently let the sugar syrup bubble until it has gone golden and thick (roughly 5 mins on a low heat). Take off the heat immediately once the desired consistently has formed. Ease the base into your pie dish before pouring in the cooled rhubarb and the syrup. Place the lid over the top and seal firmly around the edges. Using a sharp knife create a cross in the middle of the pie so that the heat can escape. Add any decorations you like before adding a wash of milk to help the pastry brown. Place in an oven on gas mark 4 for 35-45mins or until the filling is hot and pastry cooked. Serve immediately with vanilla ice-cream, custard or natural yogurt. 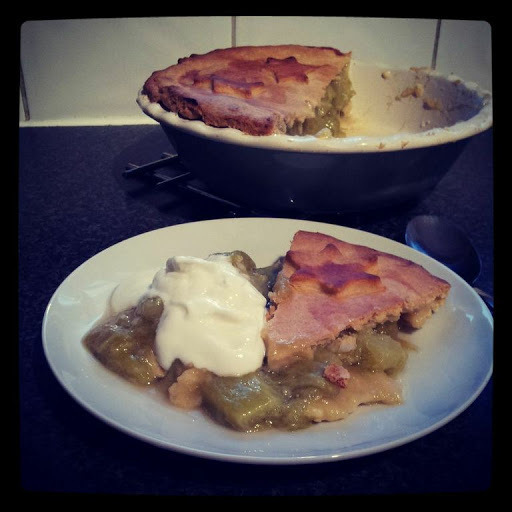 I love rhubarb and your pie looks gorgeous! Thanks Jackie! The first time I made it I fresstyled different sized hearts 🙂 I love pastry!! !